Effortless, powerful, clean, loud, musical and has deep deep extension( the kind you don't hear but shakes you and everything around you). it's large, very large, but i got used to it in less than a week. I'm actually writing a review on the newer PB12-NSD/v. It's only the second ht sub i have owned. I love bass and this sub gives me lots of it. my room is 17'x9'x8' and this sub shakes the walls and pretty much anything in my house. I chose this sub over my other choice, the PB-10ISD because i wanted the deeper extension this sub can give me by using the port plugs. this sub hits hard, clean, it's loud and no matter how loud or deep the action may be, it never shows any signs of distress. it handles everything i can throw at it, then returns everything back violently. every scene with deep bass gives me giggles and makes my grin reach from ear to ear. it also plays nice with music. it never overpowers any music that's playing; it only enhances the listening experience. this sub is the real deal. I've always had dual subs in my car and though those sounded pretty loud, i know they can't match the overall package the PB-12 delivers. 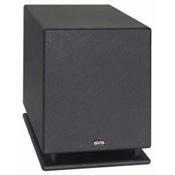 my other ht sub was a pretty weak 8'' onkyo.